Fun Family Phonics is the culmination of 35 years of teaching experience. After graduating in education from the University of London, Muriel began teaching in Wimbledon, England. It was there that she and a colleague invented stories about each letter of the alphabet, linking sound and shape. Over the years the stories have changed as Muriel has taught in England, Ontario and British Columbia. She has taught the children of linguists in Cameroon, Africa and worked with their parents who were Home Educators. She has also taught English to teachers in China. 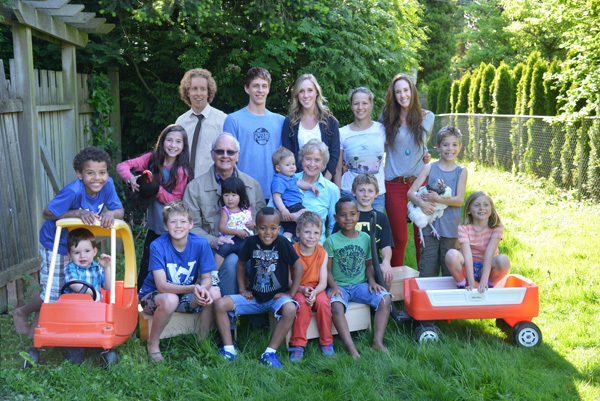 Muriel with her husband, Jack and her 17 grand children. It is very rewarding to see my own grandchildren develop a love for reading with the help of my program. Training in Linguistics and ESL as well as many other courses has proved helpful in developing the materials that comprise the “Fun Family Phonics” series. Muriel continually updates and adds to her material to keep it current with the needs of the teachers and children. She has been a college instructor in Language and Literature and owned a preschool in White Rock for many years. Muriel published her first book in 1995. Her first two books are now Canadian Best Sellers.